My name is Jen Huffman and I am the granddaughter of Joe Rantz – 1936 Olympic Gold Medalist and main character in the NY Times Bestselling book The Boys in the Boat by Daniel James Brown. I started rowing eight years ago, a couple of years after my grandpa died. When my son was introduced to the sport, I decided that I was going to try it too and found sculling to be a perfect fit. 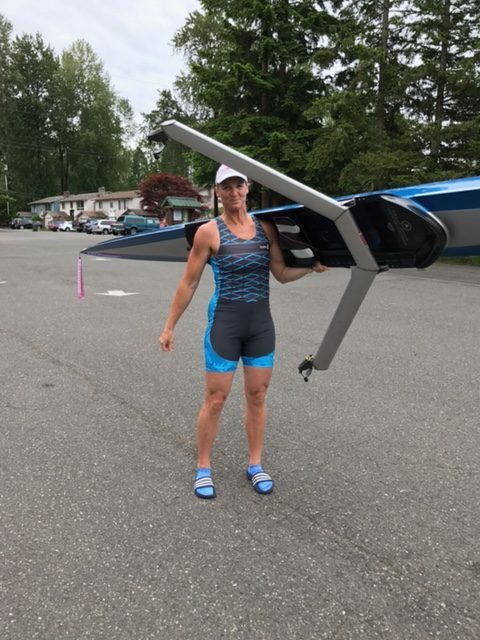 In the last seven years of competition, I have won 26 medals at Northwest Masters Regional Championships, including gold medals in both the single and double sculls every year for the last six years. I was the 2014 Canadian Masters Nationals champion in three events. I have qualified to the World Indoor Rowing Championships, and I have medaled in the single scull at Head of the Charles, the world’s most prestigious head race. None of this would have been possible without my coach and team at North Cascades Crew. It is rare to find a rowing team with a Masters coach who is as committed as our coach, Fleming Brainerd. I had never even seen a shell up close before heading down to Lake Stevens with my son seven years ago, and now the sport is central to my life. 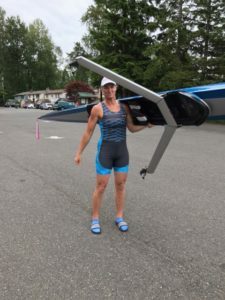 Our coach is passionate about rowing and brings that passion to everyone he coaches, regardless of whether they want to row recreationally or competitively. Rowing is a sport that serves people of all ages, even people in their 70’s and 80’s! It is a way to enable more people in our community to access our lake, stay fit, meet new people and be a part of something larger than themselves. Along with having a great coach, we also have outstanding people from all walks of life on our team. From pediatrician and optometrist to CPA, teacher, project manager, massage therapist and advertising executive – our group is diverse and full of life. Because of our diversity, we are passionate about our lake environment and actively contribute to making Lake Stevens a better place to row and live. North Cascades Crew partnered with the Snohomish County Conservation District to learn about the natural lake environment. All of our Junior rowers are now stewards of the lake after taking a water testing class and learning how to look for algae blooms and be “first eyes on the lake” for the county. We are in the process of adopting a park to plant a water garden to demonstrate to the Lake Stevens community how water gardens can be a beneficial to the environment. North Cascades Crew partnered with Snohomish County Parks and Recreation at our Wyatt Park location to help keep park grounds clean and free of litter. Our club is a non-profit volunteer driven organization where all of the board members volunteer their time to keep the club running smoothly. We are working towards building a boathouse, which is where we need your help. When North Cascades Crew entered into our contract with Wyatt Park, we also gained an area to build a boathouse. It is hard on our boats and our rowers to not have a place to be sheltered from wind, rain, hail and snow. Sun is also very hard on the equipment, aging it far more quickly than it would be if it was sheltered. With a boathouse, we will be able to shelter and secure our boats while providing a place for safety launches. Our rowers could stay warm, dry out or hold practice on rowing machines when the water is rough. North Cascades Crew is looking for funding to make this dream become a reality. 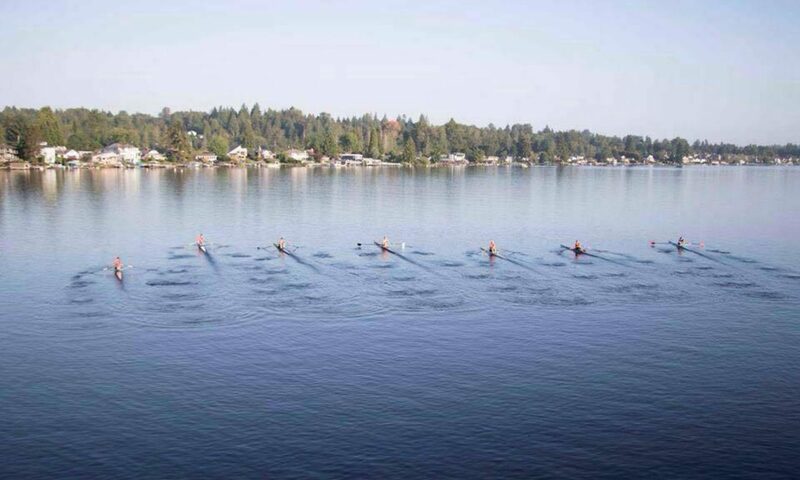 With your support, we intend provide the community with an environmentally sustainable building that will not only house our rowing club, but be an asset to the parks department and the Lake Stevens community. Thank you for your time and considering a tax deductible donation tier to help North Cascades Crew.